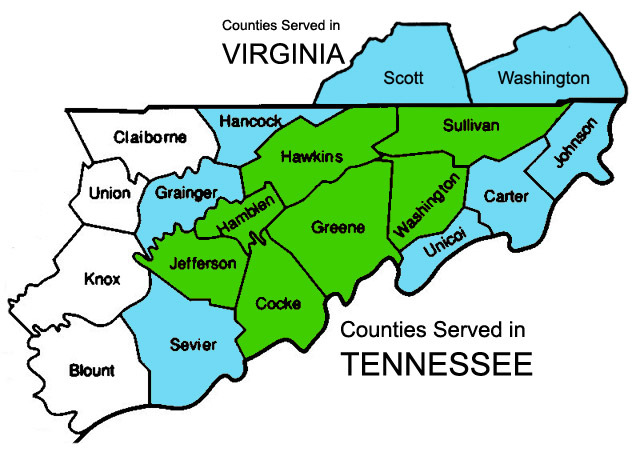 Full Service: Cocke, Greene, Hamblen, Hawkins, Jefferson, Sullivan, Washington counties in Tennessee plus Bristol, VA.
Limited Service: Available in Carter, Grainger, Hancock, Johnson, Sevier, and Unicoi counties in Tennessee and Scott and Washington counties in Virginia. Our service area is subject to growth. If you are in a neighboring area, please contact us for service availability.